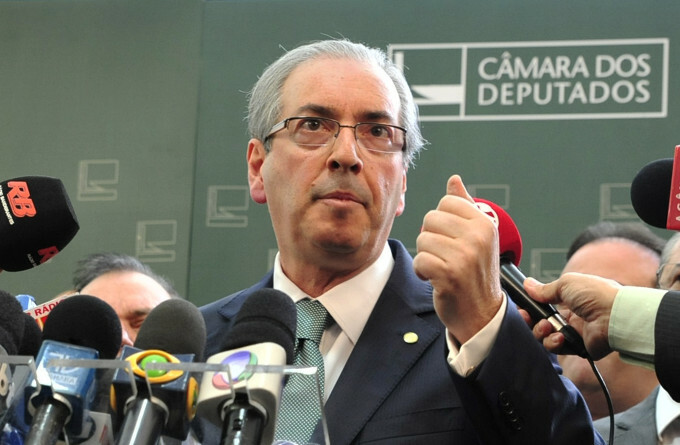 Eduardo Cunha, president of Brazil’s Chamber of Deputies, has been leading the charge to impeach President Dilma Rousseff for alleged corruption. However, there has been a bump along his road: documents revealed in the Panama Papers show that the Panamanian law firm Mossack Fonseca set up a trail of shell companies leading to illegal Swiss bank accounts containing unexplained millions. Now he’s the one investigated for corruption. Photo by the Chamber of Deputies. Denial can be a way of life down here. The Brazilian construction giant Odebrecht was decapitated in the middle of last year with the arrest of its CEO, Marcelo Odebrecht. It was about bribes paid to officials of the Brazilian state-owned Petrobras oil company. Marcelo was convicted and sentenced to a bit more than 19 years in prison. In a new round of raids police and prosecutors swept down on the premises of his successor. Brazilian authorities claimed that they found the new CEO in possession of a spread sheet detailing payoffs to some 200 public officials. It was old hat for the Odebrechts. In 1992 they were a clearinghouse for construction companies to rig bids and suppress competition. Politicians received kickbacks from the inflated contracts. President Fernando Collor de Mello was forced to resign. This time, police and prosecutors say, Odebrecht was more sophisticated. The money that went back to Petrobras officials passed through a maze of corporate shells and numbered bank accounts in several jurisdictions, some of them British dependencies. These elaborate money laundering trails were designed by Panamanian lawyers who specialize in that sort of thing. Most of the companies were no more than conduits through which money flowed. Some were Panamanian, some were not. This time Odebrecht’s activities were more widespread. Against the backdrop of continuing police raids on the offices and homes of construction executives, a political consultant power couple was called home from the Dominican Republic, where they were working on President Danilo Medina’s re-election campaign. João Santana and Mônica Moura were arrested when they got off the plane in São Paulo, formally on charges of using illegal (under Brazilian law) secret foreign bank accounts to receive millions of dollars. Under questioning Moura admitted that this was how she and her husband were paid — by whom she professed not to know — for managing the political campaigns of the MPLA in Angola, the Chavistas in Venezuela and former President Ricardo Martinelli’s Cambio Democratico in Panama. Prosecutors say that the money trails into those accounts lead back to Odebrecht. There was a hue and cry, and Varela introduced legislation to bar companies convicted of corrupt practices from bidding on public contracts in Panama — but the conviction has to be in a Panamanian court. The charges and convictions elsewhere are treated as foreign matters which have nothing to do with Panama. So is it a British scandal or a Panamanian scandal? UK Prime Minister David Cameron’s late father parked a fortune in offshore tax havens — some to be inherited by the politician son who rails against tax havens. The corporate shells were made in Panama. It is easy to blame Panama for the corruption of the industrialized world. Faux nationalists now petition to change the phrase “Panama Papers” to “Mossack Fonseca Papers,” so as to protect the nation’s honor. But what honor? The law firm’s partner and co-founder, Ramón Fonseca Mora, is a minister in President Varela’s cabinet. He was the president of Varela’s Panameñista Party. It is unfair to cast all blame on Panama. However, when other countries are looted, Panamanian lawyers help the crooks do it and proclaim that all is legal under Panamanian law. The natural response of many people around the world is to look at Panama as a variety of international nuisance.